We’ve all heard of the wolf in sheep’s clothing. 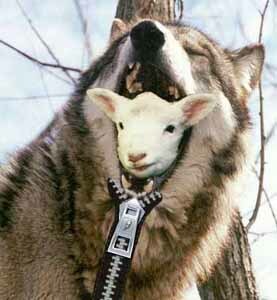 Today, I wondered what would a sheep in wolf’s clothing be? I’m narrating Peter & the Wolf this coming Sunday for the San Luis Obispo Symphony’s Family Concert and historically, stories about wolves are dire. Our deep fear and prejudice of wolves must be projection of our frightening, predatory selves since the actual incidence of wolf attacks on humans is quite low. “Attacks due to provocation have occurred, usually involving shepherds defending their flocks, though none recorded fatalities. Unprovoked attacks by non-rabid wolves are rare, but have happened. The majority of victims of unprovoked healthy wolves tend to be women and children. Historically, attacks by healthy wolves tended to be clustered in space and time, indicating that human-killing was not a normal behavior for the average wolf, but rather an atypical behavior that single wolves or packs developed and maintained until they were killed. I think we just don’t want to think about being eaten. We don’t mind that we eat, though. We don’t mind that cows and chickens and turkeys and fish and lambs and deer and rabbits, and in some parts of the US, possum, are regularly slaughtered and eaten by humans, by us. Wolves are big medicine. They symbolize our desire to have an unbreakable connection to our pack, a clearly defined identity in that pack, and an untainted relationship with Nature. The howling is pretty impressive, too. In my version of Peter & The Wolf, I’d like to see the wolf get her dinner and go free, but she’s probably safer going to the wolf rescue center in order to not be hunted again.